Getting to see the work of children’s book illustrator Jerry Pinkney is a thrill for any fan of children’s lit. If you’re in town (Atanta) before Jan. 5th, it’s an exhibition you won’t want to miss. Right now his work is the featured attraction at the High Museum of Art where more than 140 of his watercolors are displayed in addition to his work for National Geographic, the U.S. Postal Service and the National Park Service. 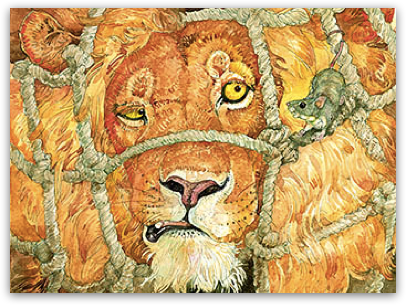 Shown above is a detail from the Lion and the Mouse, his Caldecott medal winning book.